What if we tell you that you can work magic with scissors and once you’ve mastered it, you’ll never reach for your electric gadgets anymore? Besides that, you’ll feel like a true lumberjack, trimming your beard with a pair of blades. 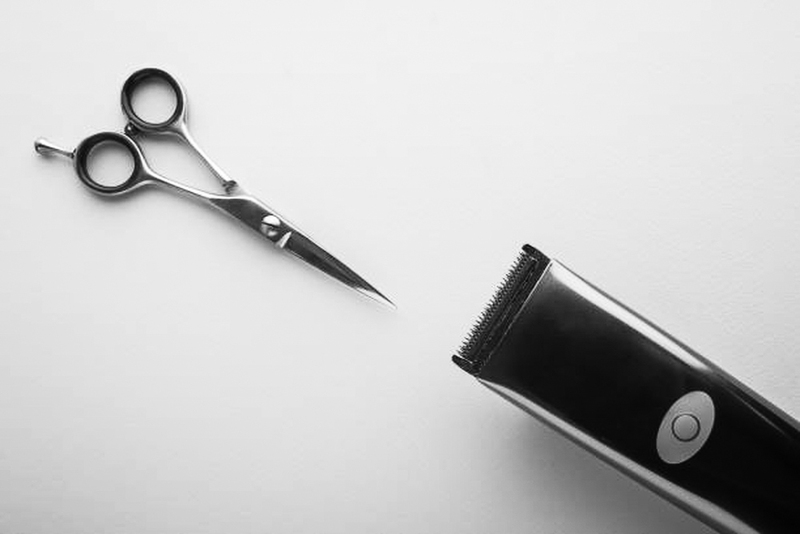 In this article, we’ll break it down into some really easy steps to show you how to trim a beard with scissors. Why Should You Trim Your Beard at All? Step 4 – Bottoms Up! Your beard will look fuller – Cutting out all the loose and stray hairs in your beard will provide a much more compact look due to its improved density. You will look much better – Simply put, you’ll be much more attractive. There are stubborn hairs which can’t be fought any other way than cutting them off. The symmetrical appearance of a nicely trimmed beard looks much better than some asymmetrical growth on your face. Also, don’t forget the fact that a nicely trimmed beard will accentuate and strengthen your jawline. You won’t rely on beard products that much – When your beard is all messy and uneven, you tend to apply tons of beard oils and balms. When you’re keeping it nicely trimmed down, there’s less need for those. 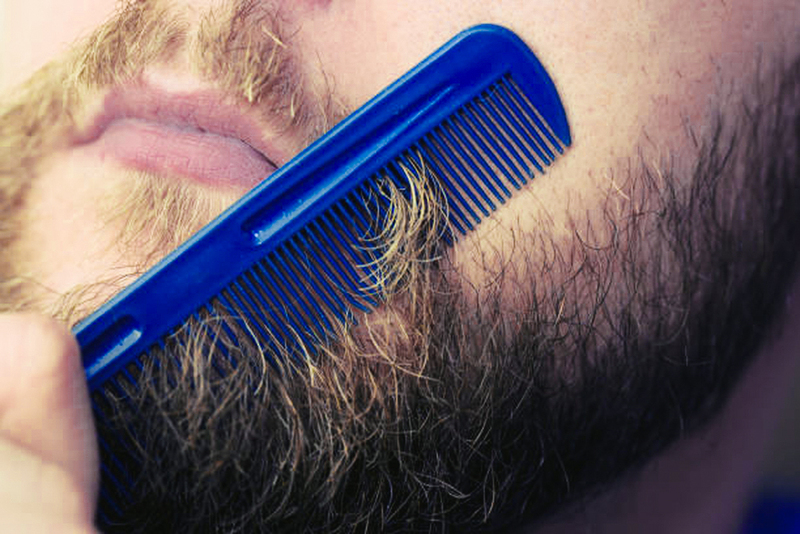 You won’t find bits and pieces of food in your beard – OK, it’s impossible to not get some soup in your mustache, but when you taper off the unevenly long hairs around your mouth, the chances of getting food stuck to your facial hair are greatly reduced. You will live a healthier life – If you don’t trim your beard regularly, you are at a much higher risk of getting your pores clogged with bacteria and dirt. Also, cleaning your face is much easier when your beard is nicely trimmed. If you’re still not convinced about using scissors to trim your beard and you still think a beard trimmer is far more convenient, let’s compare them briefly in a nice good old of pros and cons. Beard trimmers are available in a wide variety of sizes, shapes, powers, and with various add-ons. Yet again, they do have their own weak spots. Once you’re aware of all the advantages, let’s dig in to see how to trim a beard with scissors! We’ve broken it down into nine steps that are easy to follow. Even though this may seem like a bit too much and not that convenient, yes, you do need to take a shower before trimming your beard. Why? Because by doing so you will get rid of all pollutants and debris that are trapped in your beard. Those of who you use beard balms and oils need to make sure to wash it all out thoroughly. There are lots of beard shampoos out there that can help you with that. When you’re looking at your beard during trimming, it really needs to be clean so that you can cut it properly. Like with any other art, it’s important to pick the right tools, or else you’ll end up looking even worse. Please do steer clear of any cheap multi-use scissors because these will only damage your hair. Pick up a set of scissors meant for your beard exclusively and don’t use them for any other purpose. When choosing, go for those with shears no longer than 5 inches, as you’ll need to handle and control them properly. Besides the obvious, you will also need a quality comb. We recommend using combs with a narrower width between the teeth. Go for a sawcut and hand-polished comb because it will not be too flimsy, its teeth won’t break and it won’t have any micro-jagged edges that damage your beard follicles. The third step of our little how to trim a beard with scissors tutorial is actually the most pleasant one. Use your nice, new comb to simply comb your beard up and down, which means both with and against the grain. By doing so, you’ll have a much better understanding of which areas need to be worked on so that you can trim your beard accordingly and evenly. When first starting out, the easiest way is to simply follow your jawline, as you need to learn how to handle scissors properly. Always go for the chin first, as it will make it easier to determine the looks of the rest of your beard. You may not get to the preferred look in just one day, as you constantly keep cleaning up the beard with additional passes. Once you have a rock-solid bottom on your chin to build upon, you can work your way up the sides of your face. This is where you will realize that not all hairs grow at the same speed. You need to scale back the hair on your sides so they blend more harmoniously with the hair on your chin. As we’ve already mentioned before, symmetry is the key. 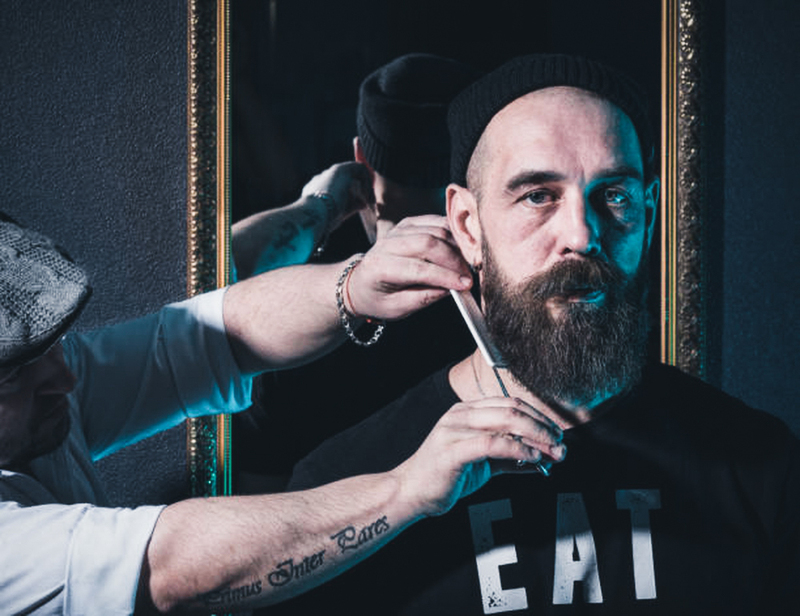 How to trim your beard with scissors without cutting your neck? Well, it is a bit trickier than the upper parts of your face, but the neck area shouldn’t really worry you that much. Always make sure that the length of the hairs on your neck never exceeds the length of those on your chin. If you don’t get this one right you’ll end up with a sloppy beard. Once all the main areas of your beard are covered, you can just work your way up by cutting the hairs upwards. Cutting your hairs only straight across won’t give you that natural look you get after visiting a barber. If you really care about how your beard looks, you’ll devote days to it. You can’t really do it all at once, especially when you’re totally new at this. The more you do it, the better you’ll get at it, and the trimming sessions will become a breeze. As you probably know by now, trimming your beard is not the only care it needs to look good. You need a good conditioner, usually in the form of beard oil or beard balm. They all contain two primary ingredients: the carrier and the essential oils. Balms usually contain butter and wax as well, so make sure you find what feels best for your beard. Now that you’ve mastered the lost art of how to trim a beard with scissors you can give yourself a round of applause and enjoy the completely new look on your face. 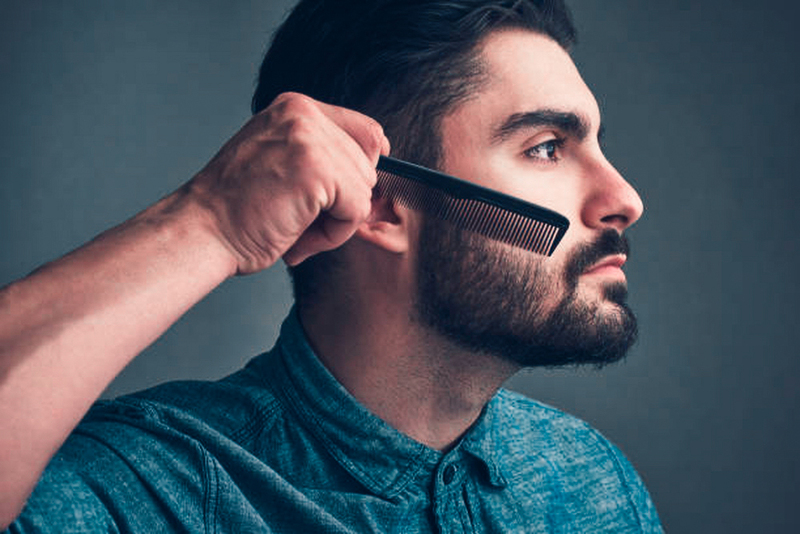 We know that it isn’t an easy process to learn and that there isn’t always that much time to fiddle around with scissors when there’s a beard trimmer nearby, but you’ll feel a lot better once you’ve taken full control of your beard.